Every game developer strives to release a perfect game. Many bugs are hard to predict, especially for indies with only a few computers and no experience. I wanted to document some of the things I missed in the hope that other developers will not miss them. These are especially relevant for native (i.e. C++) games which are a little closer to the platform than e.g. Unity games. Almost all of these bugs were fixed during our Early Access period and before the “official” release. 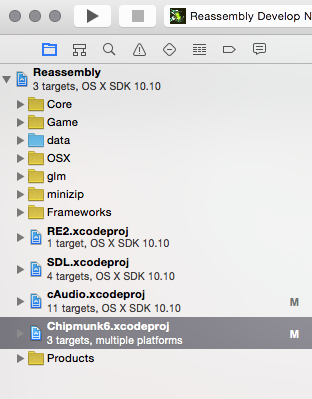 The vast majority of Reassembly work/bugs during the Early Access period related to gameplay elements. The bugs listed here are selected for possibly relevancy to other games and are mostly in the platform layer. A complete list of changes is available on the Steam Announcement Page. Steam usernames are UTF8 and frequently contain ƃᴉzɐɯ∀ st☢ff. Reassembly uses Google’s Droid Sans Fallback and Open Sans Emoji to provide additional characters for rendering usernames, and SDL_ttf or Cocoa/NSFont to actually render the text, depending on the platform. In an ironic twist of fate, the first version of this article was lost because wordpress choked on a U+E10D (rocket) character. The game may be installed in e.g. C:/вещи/Steam/SteamApps/…. so any assets must be loaded using unicode paths. OSX and Linux use UTF8 for everything and are easy to support but Windows builds must convert to wchar_t* UCS2 encoding via WideCharToMultiByte/MultiByteToWideChar or similar. Non-English versions of Windows return native-language error messages in GetLastError/FormatMessage. This means that any logging mechanisms must support unicode. Printf/sprintf on windows support a %ls format specifier for wide character strings but will crash on non-ascii (thanks to Russian alpha tester Krypt for helping me track down this bug). Games that hardcode WASD will not be playable on many Non-English keyboards. Keybinding systems must support unicode keyboard input. Vsync on/off/adaptive options are probably a good idea. Adaptive Vsync (aka tear control) is a good solution but is not supported on all drivers. Many players have old/slow GPUs that won’t achieve 60fps and consequently would have a bad experience under Vsync. Some players have 144hz monitors and would like to take advantage of them. Should the game launch in a window, in “true” fullscreen mode, or in a borderless fullscreen window (fake fullscreen)? True fullscreen mode has performance and especially smoothness advantages, while fake fullscreen allows easier alt-tabbing. Reassembly simplifies video monitor modeset issues by always using the same fullscreen mode as the desktop, and defaults to true fullscreen. Some people have their desktop set to 16 bit color depth. This may cause OpenGL context creation to fail if you request a 24 bit framebuffer. Significant numbers of Steam users have GPUs that only support OpenGL 2.1. Things like framebuffer objects, floating point framebuffer formats, and various functions may not be available or may only be available through older EXT variants (check GL_EXTENSIONS). Various GPUs do a poor job of implementing certain OpenGL features. For example, antialiased (GL_LINE_SMOOTH) lines look terrible on many ATI GPUs. Adding video options to the game allows players to work around unforeseen problems. Many people still have 4:3 monitors. If the game resizes UI elements according to the current aspect ratio, make sure to test at 4:3 (in addition to 16:9, 16:10). Many people will disregard minimum system requirements and try to run the game on very old/slow computers. Detecting the OpenGL version and at least popping up a sympathetic dialog is much better than crashing in these cases. Adding options to reduce CPU/GPU usage at the const of graphics quality will also allow many people play your game that otherwise could not. Test the game on hard drive systems and SSD systems, particularly if any kind of asynchronous/streaming system is involved. Hard disks can be VERY slow – you may need loading progress bars in places were SSD systems would not. Different gamepads have different polling intervals, button mappings, deadzone requirements, etc. Test at least PS4, PS3, Xbox 360, and Xbox One controllers. With an event based API like SDL_GameController, make sure to poll for ALL events every frame instead of just processing one, or events can get very backed up. Consider analog stick deadzone and smoothing options. 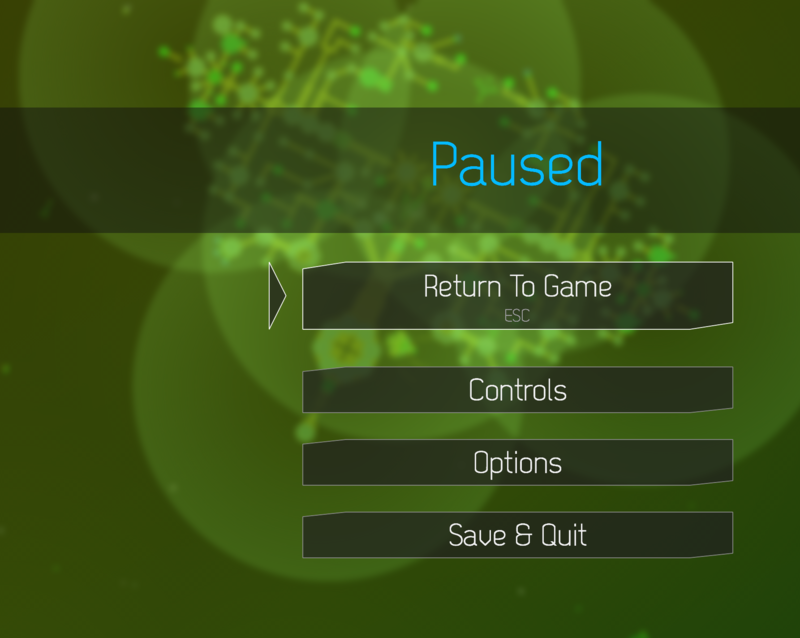 Test mouse and keyboard functionality in UIs with a gamepad plugged in, in case stray gamepad events interfere. Make sure to handle the case where a gamepad is detected but initialization fails, or where the gamepad is unplugged/plugged in during gameplay. 5 button mice are common. Make sure you don’t e.g store mouse button state in a bool array with unrelated variables immediately afterwards. Key bindings should probably still work even with caps-lock on. Many Steam users still use Windows XP. Supporting XP/Vista/7/8 with one build involves selecting the “_xp” toolkit in Visual Studio and using GetModuleHandleEx/GetProcAddress for any APIs that were introduced after XP, with fallbacks. Make sure 3rd party DLLs also support XP. Test any scroll wheel functionality on mice AND touchpads. Apple touchpads in particular can generate scroll events at a very different rate than traditional mice. There is a 1GB/1000 file limit on Steam Cloud saves. Exceeding this limit results in lost save game data. Many Steamworks API calls (achievements/stats APIs, cloud save APIs, etc. including SteamAPI_RunCallbacks()) seem to grab a global mutex and consequently can block for long periods (multiple frames) of time if another thread is for example writing a large file using the API. My solution was to only ever call steam APIs in a non-critical-path thread. Many API calls (ISteamRemoteStorage::GetFileNameAndSize, ISteamRemoteStorage::FileExists) can be very much slower than OS equivalents. If you call these frequently or depend on their performance, it may make sense to maintain a cache of results. Reassembly implements a crash handling and reporting system similar to Mozilla/Google Breakpad that has been invaluable in improving quality. Via the Win32 API call SetUnhandledExceptionFilter, it is possible to catch NULL pointer dereferences and other errors that would otherwise crash the program. The program can then collect a stack trace and log file and upload it to a server before popping up an apologetic message and actually crashing. The Reassembly code for this is on github (including a similar implementations via signals for OSX and Linux). We don’t ship .pdb files but include the .dll load addresses to enable associating symbols with the memory addresses in the stack trace. A CGI script that accepts file uploads can run on any web hosting solution and contain less than 100 lines of code. Compressed HTTP uploads are available through libcurl or dozens of other easy to use libraries. By collecting (frighteningly) large numbers of crash reports, we were able to triage and fix the most frequently occurring crashes first. It also quickly became obvious that only a small percentage of players report their crashes via email, steam discussion boards, forums, or other explicit methods, and that crashes so reported are not always representative. This method was very effective for fixing crashing of all kinds, and particularly for race conditions and other bugs that can be hard to reproduce without specific hardware. It’s very important to anonymize collected log files, including removing information like the current system username which may be present in paths. Indie Voyage, our Kickstarter/publishing partner, hired a professional QA tester (Chris Watkins) in the month leading up to release. He uncovered a large number of UI, tutorial, and general user experience problems and greatly increased the game quality. In retrospect I would have allocated more of our Kickstarter budged to this area and started sooner. One of the dangers of Early Access and similar community-driven systems is that players quickly learn the game and focus on advanced end-game features. Players that are put off by the initial experience do not contribute to the community. Focusing development on the end-game is valuable but can leave new players confused. Despite my best efforts Reassembly is still not 100% bug free. I’m very proud of how close we have come, and hope the accumulated knowledge is useful to someone. I did search for a service that would automatically run the game across hundreds of machine and OS configurations looking for problems but was unable to find one. We had a system (actually, at least three different systems) like this while I was at Nvidia for testing the driver and various internal tools and it was great. Hardware dependent graphics problems are a persistent issue. The cross product of GPU/driver/OS is very large. Actual crashes are great in the sense that they produce stack traces and can usually be worked around directly by e.g. checking GL_EXTENSIONS more carefully or avoiding undefined behavior. Rendering glitches – parts of the scene mysteriously not visible, unexplained z-fighting, etc. – are more insidious. I have not found a good way to debug these besides guessing or buying the GPU in question and hoping to be able to reproduce. I’m back from my post-release vacation and excited to get back to work on Reassembly! These are the things I plan to focus on in the coming month. In game, convert an existing save slot containing ship designs into a “mod” for new-faction mods, or create an empty “mod”. A mod consists essentially of a number of text config files and spaceship files. Edit text files to define the mod. This includes adding new blocks or modifying existing blocks, adding or modifying spaceships, changing one of nearly 300 cvars that control various game behaviors, modifying the world generator config file, tutorial or message text, shaders, etc. You will be able to reload config files in-game and view relevant syntax errors. In game, upload the mod to the steam workshop. Players will be able to download mods through the steam workshop and then turn them on or off and select precedence (if mods conflict) in-game. I’m excited to see what people come up with! I expect modding support to go through several iterations as we work with modders to expose more functionality and improve the workflow. Modding support should allow the community to experiment with tons of new content much faster that I would be able to support myself. Better control over AI, both in tournament mode and in the main game, is probably the #1 requested feature. There is already a system in place for generating AI programs based on ship design and faction personality, so most of the work is in UI design. I’m planning to have per-design (this ship should only attack from long range, this ship should always rush, etc.) AI policy plus global fleet policy (everybody stop shooting, attack anything that moves, etc.). A significant fraction of our players are not native English speakers and translating the relatively small amount of in-game text and providing better default keybindings should improve their experience. The game already uses Unicode internally so code changes should be minimal. If anyone is interested in helping translate the game into their native language and/or setting up keybindings, please contact me. Likewise, adding gamepad support to the editor and menus would not be a huge amount of work and would be cool. I recently added a search feature to the wormhole feed – there used to be a giant list of users at the bottom of the page but it was getting out of hand. I’ll continue to improve this system as well as the game server which processes wormhole uploads decides which agents populate new worlds. I’ve received several reports of black screen issues on certain just-barely-supported video cards. There are a few lingering general crashes, and glitches like agents spawning inside of asteroids. The tutorials, as always, need polishing. Some players are reporting trouble downloading agents when starting new games. There are always thousands of little changes that significantly improve gameplay but aren’t worth writing about individually. I expect this work to take up most of April. Game development is an iterative, community-driven process and we’ll take another hard look at the game for June and see what needs to be done. Thanks to everyone that submitted ships and or tuned into the February 28th tournament! Special thanks to DeluksGaming for joining us! Amazigh’s Funnel won the interceptor category and CmdrJohn’s Federation Run And Hide won the probe category. We will conclude the tournament on March 14th at 2PM PST. I, Arthur Danskin, the copyright holder of Reassembly, grant you, whoever you are, permission to post or stream footage of Reassembly on youtube, twitch, or similar video sharing sites, in the context of Let’s Plays, reviews, or for other purposes. You may also monetize this footage. You may additionally include the game music in your video. Including a link to purchase the game (store.steampowered.com/app/329130) and/or soundtrack (peakssound.bandcamp.com/album/reassembly) is encouraged but not required. Also, thank you for posting videos. As an independent developer with a very limited advertising budget I rely on this kind of thing to let people know about my game. The day is finally here – Kickstarter Beta backer and Alpha tester keys will be going out early tomorrow morning (November 25, 2014). The Steam Early Access page is up and the game will go on sale when keys go out. I’ll get a steam widget up on the front page some time soon. Thank you again to all the Kickstarter backers, the alpha testers, Peter, Colin, Rob, Christine, Eddie, and everyone else who contributed to this release. This is just the beginning! I’m excited to see all the new spaceships everyone is going to build, and I’m excited to get tons of feedback from the new influx of beta testers and get back to work. Please direct suggestions and bug reports to the forum! I wasn’t able to get Linux Steam integration ready in time for the deadline. The game already runs on Linux and some of our Alpha testers run the Linux version – I expect that it should be ready on Steam within a week or two. It’s been about a month since the last update and we are well on our way to Beta release! 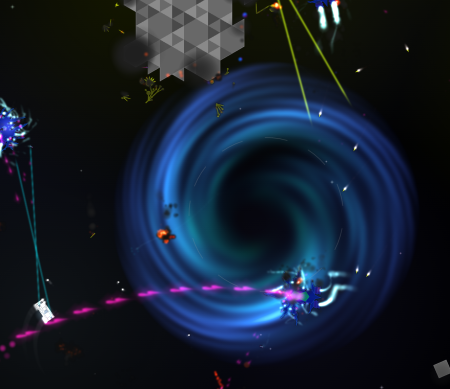 After flying into a wormhole, players can now upload their current fleet to the server. These fleets will be downloaded from the server and injected into newly generated worlds. Players can conquer their way across each world, defeating other player fleets, and then fly thorough a wormhole into a new world. 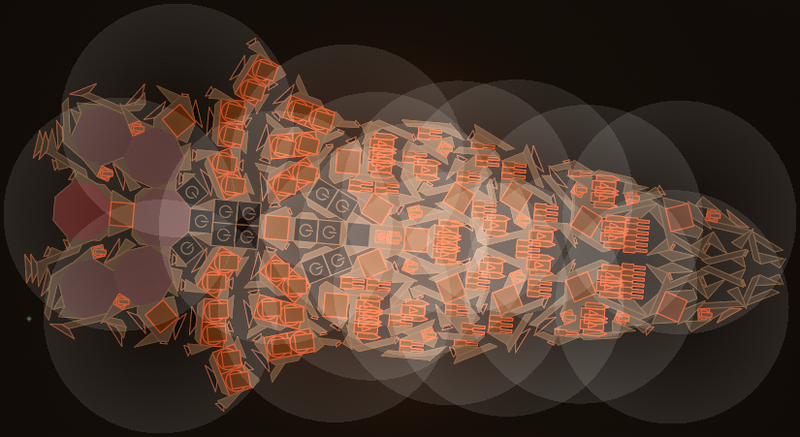 Injected fleets will stick together, get in fights with ambient ships, and generally behave like the player’s own fleet. Server authentication works either via steam or by reusing the Anisoptera Games Forum login info. This is essentially to prevent players from impersonating each other and so we can keep track of which fleets each player uploaded. Login is only necessary for uploading fleets. There is still a lot to do with respect to notifications and organization. Eventually we want to allow players to track statistics from their uploaded fleets – how many players did it kill? How many people fought against it? There should be a way to browse uploaded fleets, maybe upvote especially cool ship designs, and so on. We are also considering some form of steamworks integration. We were able to playtest the newly improved beginning of the game through our showcase at the MIX at GDC Next just last week and found that people were able to start playing the game without instruction much more effectively than at PAX Prime the month before that. In several instances players asked me a question, only to have it immediately answered by an in game tutorial prompt. There is still work to do in this area but I’m confided that Beta testers will have a good first impression. The folks at Valve have done an excellent job making the steamworks integration process as painless and straightforward as possible The steam overlay, for example, required a grand total of one line of code to enable. Beyond setting up the store page and uploading builds, we have also added support for the steam cloud so that saved games will be seamlessly transitioned between computers. As part of this work we enabled gzip compression on the (plaintext) save file format, making save files much more compact (previous alpha builds could generate hundreds of megabytes of persistent data as the world was explored). Beyond these main items and fixing lots of bugs we also found time to do some graphics improvements. There are new snazzier shader effects for resource blobs. The gpu-based particle system was modified to use GL_POINTS instead of triangles, making it both faster and prettier, and the inter-menu gaussian blur effect was greatly improved. The same blur shader is now applied at a much lower setting to add bloom to weapon and particle effects. These effects can all be disabled on low end systems. There is also a new box on the devlog page to the right (just below the twitter widget) showing recent source code commits.